Summary: Much of the efforts to fan climate hysteria rely on false descriptions of current climate science, most especially on the assertion of a consensus that does not exist. The articles on the FM website puncture this simply and surely by showing a diversity of opinion expressed in presigious peer-reviewed journals about the history, causes, magnitude, and forecasts about global warming. Much of this is hidden from the general public by the news media. This post is another in that long series. For a partial list of the these studies see the FM reference page Science & climate – studies & reports. Rising sea levels are one of the most graphic and easily understood consequences of global warming. Cities, even entire islands, submerged later in this century (per earlier warnings, even by 2010). As shown in the posts below, the climate science literature offer little support for such extreme forecasts. Coming out of the little ice age, sea levels have risen at a steady (if difficult to measure before satellites) rate for over a century. Scientists debate if the melt rate is increasing (other than 10-20 year variations). It’s cutting-edge science, far from consensus — and hence no basis for massive public policy changes. This post describes the latest volley. As usual, we’ll start with summary intended for a general audience before looking at the underlying study. It’s the “big number” tactic of doomster pseudoscience. A gigaton (metric) of ice forms a cube with sides of aprox one kilometer. The oceans have an area of aprox 360 million square kilometers and a volume of 335 million cu km. Melting one gigaton of glacier ice raises the sea level less than 3 microns. Current rates, still debated, of glacial melt raise ocean levels aprox 3 mm (i.e., one foot) per century. Melting of floating ice (e.g., at the north pole) does not raise sea levels. Greenland’s ice cap is roughly 2.5 million cu km; Antarctica’s is 25 cu km. “Sea-level rise: Ice-sheet uncertainty”, David H. Bromwich and Julien P. Nicolas, Nature Geoscience, September 2010 — Abstract here. Free copy here. “Satellite gravimetry has been playing an increasingly important role in monitoring the state of the polar ice sheets since 2002. A suite of mass-balance studies based on the Gravity Recovery and Climate Experiment (GRACE) mission has revealed substantial losses of ice-sheet mass in Greenland and West Antarctica. What’s more, the contribution of the ice sheets to global mean sea-level rise has accelerated over the past few years. Writing in Nature Geoscience, Wu and colleagues describe an innovative approach employed to derive ice-mass changes from GRACE data and suggest significantly smaller ice-mass loss overall than earlier GRACE-based estimates. Global water transport between oceans and continents during the transition from glacial to interglacial times has been enormous. The viscoelastic solid Earth has been responding to this unloading of large ice masses with a rise of the land masses, in a process termed glacial isostatic adjustment. In addition, significant changes in the land/ocean water distribution occur at present. As both present-day changes in the ice/water thickness and glacial isostatic adjustment affect space geodetic measurements, it is difficult to untangle the relative contributions of these two processes. Here we combine gravity measurements and geodetic data of surface movement with a data-assimilating model of ocean bottom pressure to simultaneously estimate present-day water transport and glacial isostatic adjustment. We determine their separate contributions to movements in the geocentre, which occur in response to changes in the Earth’s mass distribution, with uncertainties below 0.1 mm yr−1. 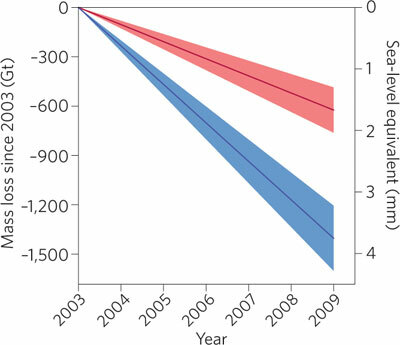 According to our estimates, mass losses between 2002 and 2008 in Greenland, Alaska/Yukon and West Antarctica are 104±23, 101±23 and 64±32 Gt yr−1, respectively. Our estimates of glacial isostatic adjustment indicate a large geocentre velocity of −0.72±0.06 mm yr−1 in the polar direction. We conclude that a significant revision of the present estimates of glacial isostatic adjustments and land–ocean water exchange is required. Climate doomster Joe Romm: “On ‘scientific reticence’ and sea-level rise“, Grist, 25 May 2007: “Sea level rise of 5 meters in one century? Even if most scientists will not say so publicly, that catastrophe is a real possibility, according to the director of NASA’s Goddard Institute Of Space Studies”. Previous Post How good are our global senses, watching our changing world?